When Donald Trump was unexpectedly voted in as 45th president of the United States back in November 2016, many commentators predicted it was the beginning of the end for globalization. After all, when he was running he promised to rip up trade deals , impose tariffs and throw up walls . But according to Anthony Scaramucci, who from Friday will head up the White House Office for Public Liaison, that couldn’t be further from the truth. 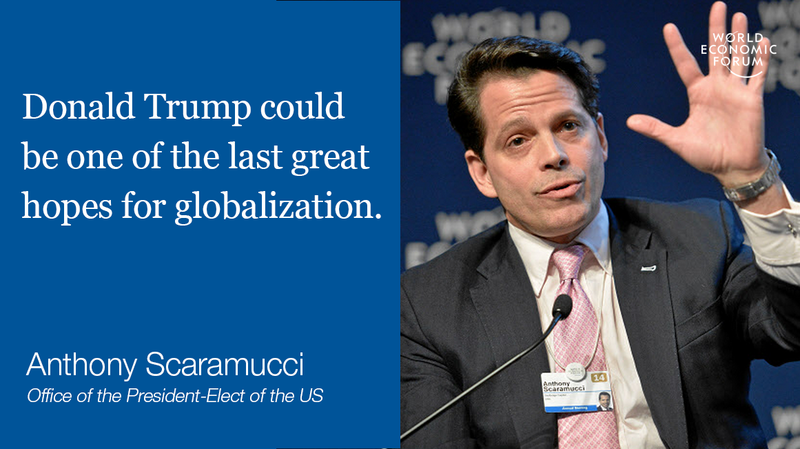 “Trump could be one of the last great hopes for globalization,” the Davos veteran told participants in a session on the first day of the Annual Meeting. By working to regenerate America’s dying middle class, Trump could paradoxically end up saving globalization: “If you can create rising wages in the US, you can create more purchasing power. And that virtuous circle of consumption will lead to global trade, and it will lead to more global peace, and more global prosperity,” Scaramucci argues. That’s not the only thing Scaramucci thinks many of us have got wrong about the next US president. On the campaign trail, Trump made headlines for his China bashing , accusing the Asian superpower of currency manipulation, protectionism and even inventing climate change . It’s left many people worried that US-Chinese relations will take a turn for the worst under a Trump administration. European leaders were said to be “astonished” by Trump’s decision to label NATO – a military alliance established in 1949 – “obsolete”. But according to Scaramucci, Trump’s point was more nuanced than most people realized. In fact, he was instead calling for a reform of an outdated institution. “NATO was designed to fortify the Western European democracies against a communist threat… Today, though, the world is dramatically different than the world we lived in before.” And it’s because of these transformations that NATO must also change. He’s on several occasions spoken out against the European Union – just a few days ago, he described it as a “vehicle for Germany”, predicting that more countries will follow Britain and leave. But just like with NATO, Scaramucci thinks Trump is actually simply calling for reform of what he sees as an out-of-touch institution. Trump has been accused of war-mongering, and has spoken about his plans to increase America’s nuclear arsenal. But that’s not the man Scaramucci knows. Watch the full session here .